SWAG Project is super excited to announce its 2015 trial CSA program that lets us bring you a fixed box of beautiful fall veggies! Please see the overview below,and contact us to join the program! Our CSA or Community Sourced Agriculture share program will run for 5 weeks, starting in October and going through mid Nov. Dates: October 16th, October 23, October 30, November 6, and (maybe) November 13. Each person who signs up will get a fixed ‘share’ or box/bag of seasonal fall fruits and vegetables (and some other specialty items when possible). 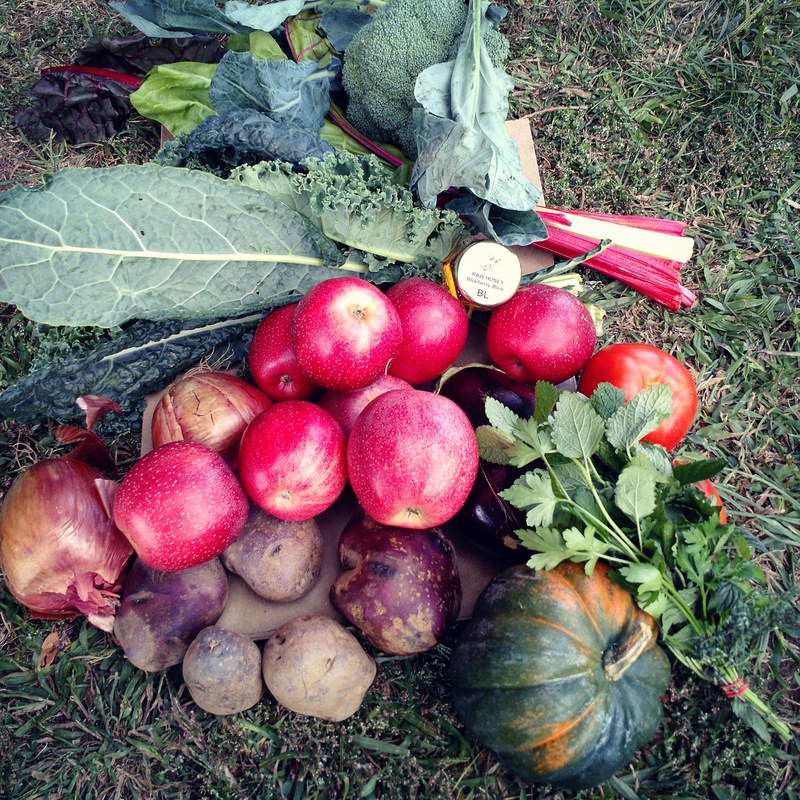 Each CSA share will be a mix of 7-10 items. There will be a mix of roots, greens, tubers, fruits, etc. While there will be some overlapping items week to week, some items will change throughout the CSA. Share size will be between 8-15 lbs depending on the items included each week. All shareholders will receive the same items as their fellow shareholders and the box will be fixed each week. Items will change week to week. Specialty: Mushrooms, Honey, Grains, Juices, etc. Some of this produce will come from our farm and some will come from other partner farms across NJ. Each share will cost $20/week. CASH only please. Shares will be paid for the week BEFORE they are picked up. People interested in joining will ‘sign-up’ with swag no later than Oct 7th. The first payment will be made no later than Oct 9th. We are asking that all people who sign up for the CSA commit to the first two weeks/shares. Ongoing payment will be made at pickup. Shareholders who want a share the following week will need to bring payment for the next week/share to the market at the time they are picking up their current share. EG: Shareholders picking up a share on the 16th will bring the $20 for the following week (Oct 23rd) share, and the same for following weeks. Friday’s between 12pm – 5:30pm you will be able to pick up your ‘share’ from the market at SWAG. Rainy-day pick-up will be inside the tabernacle building. If you cannot make the pickup, please arrange to have someone else collect it for you. This person can also make a payment on your behalf for the next week. 1) Name 1 to 3 Fall items you would be excited to cook with! 2) Name 1 Fall item you would not like to receive (if there is one). Click here to make your contribution to our vanguard Newark Ag Project – South Ward Agri-Garden (SWAG) Project. Even your small contribution goes along way toward our sustainable agriculture and youth development practices. We are investing in infrastructure that will decrease our costs each year, and we are training new youth interns to help us operate the farm in the future. So your dollars go beyond just 2015, and they go beyond just farming – they are community and people development through urban agriculture and food justice programs! We only have one month to go – so don’t wait!